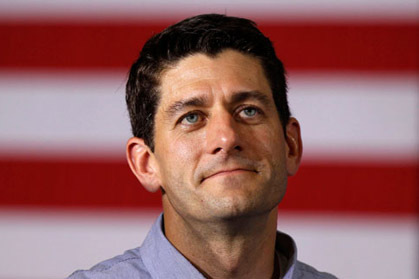 Irish American Congressman Paul Ryan is a brave pick by Mitt Romney. It makes the election a contest about ideas, the “get government off my back crowd” against the “government is needed to keep our social and economic fabric together” group. Romney could have run on just attacking Obama’s evident economic failures but he saw that policy was not working. He was seven points down in a CNN poll as late as Thursday of this week. Instead he has picked a man who was once accused -- by a Republican columnist Charles Krauthammer --- of “writing the longest suicide note in history” when he unveiled a controversial budget plan that slashed social security, medicare and medicaid. Ryan has also been attacked by the Conference of Catholic Bishops for proposed cuts to the poorest in society. The Wall Street Journal will love this choice, just a few days ago they were trumpeting Ryan and daring Romney to pick him. Romney showed a surprising gamblers instinct by doing so. It will be a fascinating clash of ideas in the Fall, not least when Ryan and fellow Irish American Joe Biden square off. I met Congressman Paul Ryan at an Irish Embassy event in Washington a few years back. He was new to Congress at the time but nonetheless, impressed with his quick mind and clear focus on the future. He looks the part, strikingly tall and handsome. He is a young man in a hurry at age 42, irrespective of how Romney does, he is now the likely leading figure for the GOP for a younger generation. He fears his family history, deaths by heart attacks before 60 have become a tragic constant in his family’s medical background. He himself found his own father, then in his mid fifties, dead in his bed and it inspired him to enter politics and try and make a difference. His Irish roots go back to his great-grandfather’s arrival in Janesville, Wisconsin a riverside town. It is a town of about 65,000 people dominated by three families, the Ryans, Fitzgeralds and Cullens, known as the Irish mafia. When Ryan had his first run for office at age 28, 14 years ago, a political advertisement showed him walking through the graveyard where his immigrant ancestors lay. The Ryans were literally the road builders and Ryan Inc, started by his immigrant great grandfather, is now a national construction company. Ryan’s side of the family went into law, however, and no longer have anything to do with the building business. Paul Ryan grew up in an extended Irish family with eight other Ryan households within shouting distance of his very impressive home which has six bedroons and eight bathrooms and is on the National Register of Historic Places -- doubly so now. He is popular and accesible to the media almost to a fault. “The key to understanding me is really simple,” he said. “I am not trying to be anybody other than who I actually am,” he told the New Yorker in a recent profile and journalists who cover him do find that to be the case. It was clear for some weeks as his campaign foundered that Mitt Romney needed a game changer VP pick - and party leaders and the Wall Street journal think the has found the man. U.S. Representative Paul Ryan could, they had argued, make a persuasive vice presidential pick thanks to what he himself calls the "checklist." "I check a series of boxes," the Wisconsin Republican reminded the media in 2008. "Young guy. Economics guy. From a swing state. Catholic." It could be the magic political formula that Romney is seeking to bolster the public's perception of him as a rather uninspiring and dull candidate. Thanks to the controversial budgets that Ryan persuaded House Republicans to pass in 2011 and 2012, he's become a national figure and something of a star of the hard right. Romney understood that magic allure when he asked Ryan to campaign with him for five days in Wisconsin this spring. Some of the math isn't promising. Only two sitting House members were selected for the vice presidential spot since 1948 by either party. Both tickets lost and neither VP pick ever held elected office again. Ryan’s age is another factor. At 42 he is the third-youngest vice presidential selection since World War II, after Richard Nixon, 39, in 1952 and Dan Quayle, 41, in 1988. According to the Boston Herald, political science researchers and academics debate whether running mates have any effect at all on presidential elections. In a 2001 paper called 'Requiem for a Lightweight,' author David Romero of the University of Texas argued they have none. Even GOP strategist Karl Rove agrees: "Running mates haven’t decided an election in more than a half-century," he wrote in The Wall Street Journal last week. But Ryan may not have gotten the memo. Since the start of 2012 Ryan’s appearances on Sunday news shows rank him second only to Ron Paul, who ran for president. Ryan has repeatedly appeared on ABC, CBS, NBC, CNN, Fox, MSNBC, CNBC and other channels. Ryan may be a practicing Catholic but that was not enough to stop the U.S. Conference of Catholic Bishops ruling his budget would hurt the poor and vulnerable. Bishops urged lawmakers to 'resist for moral and human reasons' the cuts to hunger and nutrition programs in the Ryan budget. Recently more than 80 professors and administrators at Georgetown University signed a letter to Ryan before his appearance at the famous Catholic school accusing him of wrongly citing Catholic teaching to argue for his budget. Ryan's budget calls for biting cuts in Medicaid and a total overhaul of Medicare for people currently under the age of 55, making both Ryan and his policies a political lightning rod. Romney will benefit from choosing a charismatic running mate popular with economic conservatives, but he could also be opening himself up to the divisive shortcomings of that choice too. Time will tell.